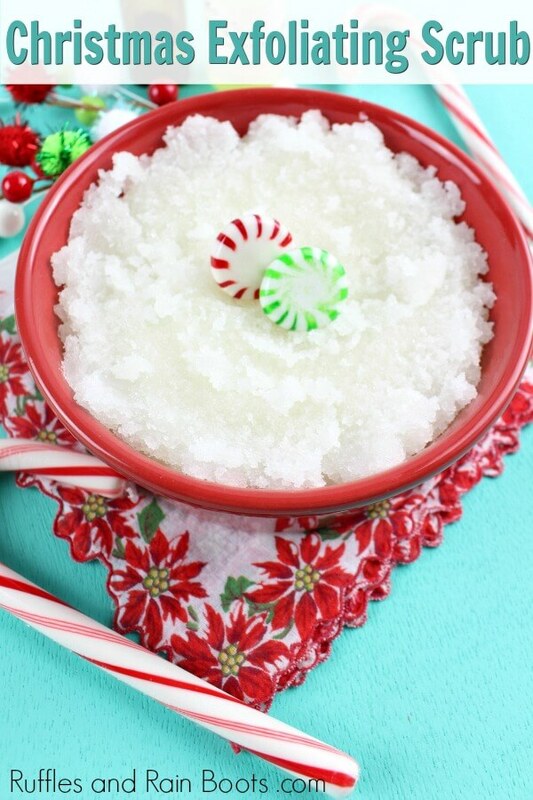 This easy Christmas body scrub makes exfoliating and gifting easy! 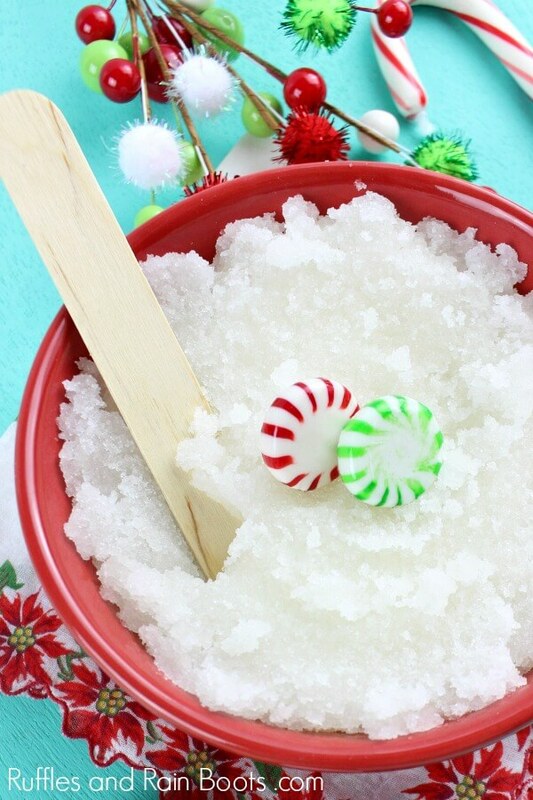 With only a few ingredients, you can make a sugar scrub for everyone on your list. 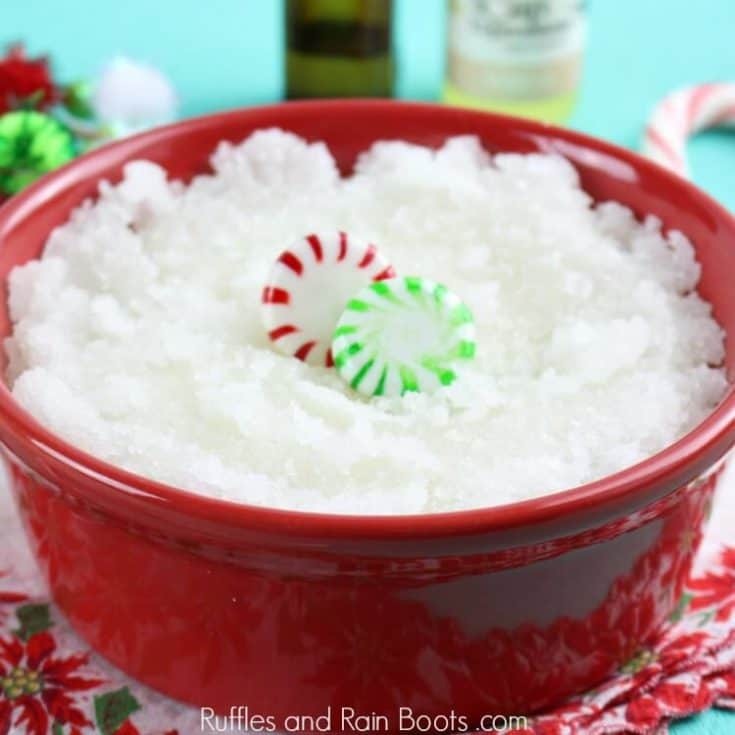 We are no stranger to making our own DIY bath bomb recipes and easy sugar scrubs here on Ruffles and Rain Boots. In fact, we think sugar scrubs and bath bombs are two of the easiest (and best for you) spa products you should make at home. 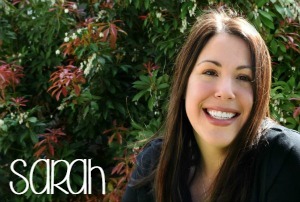 But let’s work with one of the all-time favorite scent combinations for DIY bath products: vanilla and peppermint. Friends, this smells just like Christmas! As with most of our sugar scrub recipes, you can adapt this to make a solid sugar scrub cube by adding a bit of melted melt and pour soap (see this body scrub recipe). 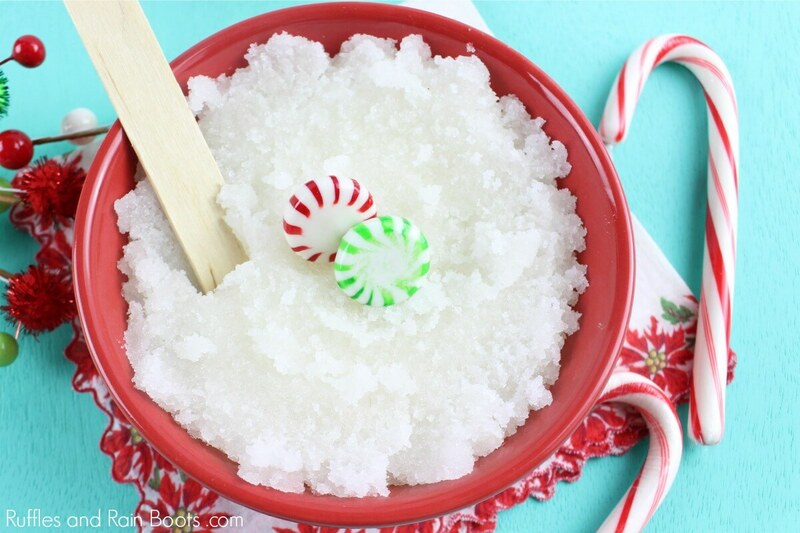 This recipe makes 1 and 1/2 cups of Christmas body scrub. If you want to make single-serving Christmas body scrub gifts, be sure to get these containers from Amazon. They are absolutely perfect for it! Or these disposable 2-ounce containers – great if you’re making A LOT of a sugar scrub. This is one of the easier scrubs to make, so grab the kids. This would make a great gift idea for teachers. If you have a playlist on YouTube to which you’d like to add this project, here is our Christmas body scrub video tutorial. Put sugar in a small bowl and set aside. 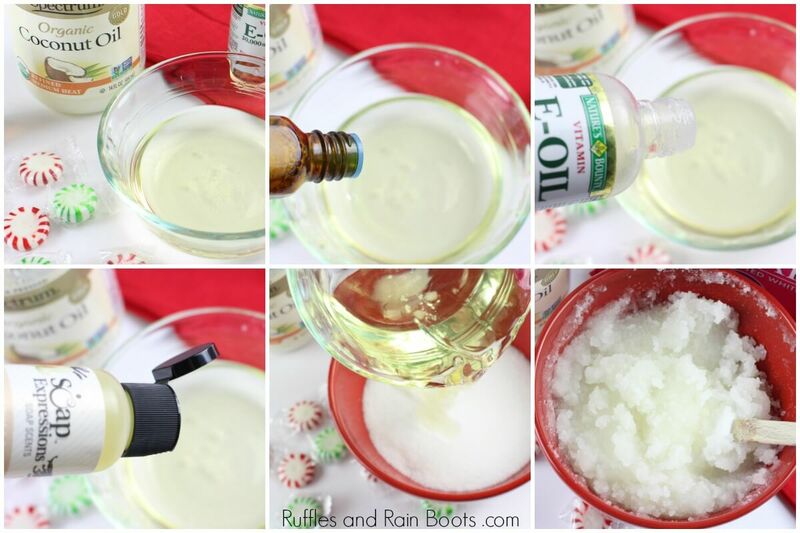 In a small bowl, mix melted coconut oil, vitamin E oil, peppermint essential oil, and vanilla scent. Mix thoroughly. Add the wet mixture to the sugar and stir to incorporate. If you’re making the exact recipe above, I would say the shelf life for this is no more than 3 months. And honestly, it might be less than that, depending on whether water gets in the container. To combat this, you can create “single-use sugar scrub servings,” by dividing this scrub into small containers (we like these). Stack up the containers, wrap up with a ribbon, and give the gift of Christmas in a jar! 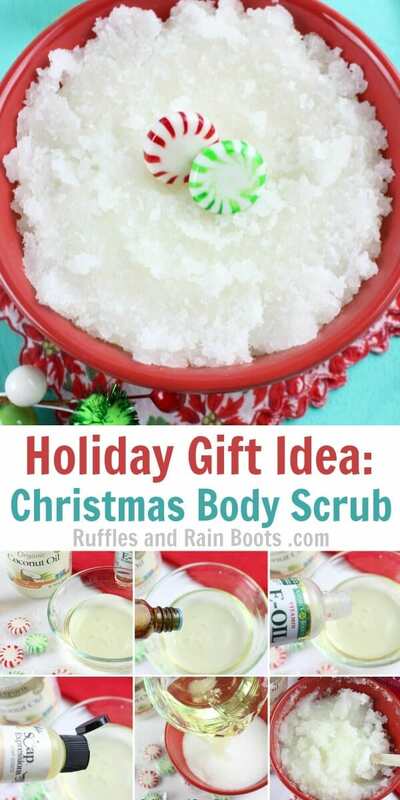 To use this Christmas body scrub, take a scoop and rub in circles on wet skin. Rinse off with warm water and pat dry.